Viva L’Italia Slots | Join and Claim up to £777 Bonus! Buon Giorno! Viva L’Italia slots will whisk you away to Italian paradise when you Spin to WIN! Visit the Leaning Tower of Pisa and the Sistine Chapel while winning Big Cash Prizes! 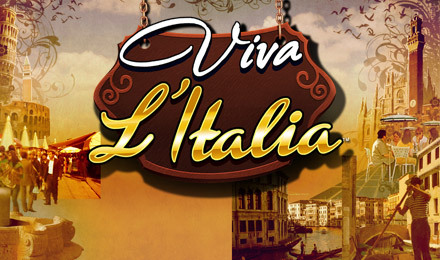 Viva L’Italia slots will transport you to a beautiful Italian vacation complete with exciting bonuses and cash prizes! Visit the leaning Tower of Pisa, San Marco Square, the Vatican, the Sistine Chapel and the Colosseum when you spin the reels today! The Viva Italia logo is the Wild symbol and will help you complete winning paylines whilst tripling those wins! Have a taste of some fine Italian wines when you land the Wine Bottle Scatter and trigger the Free Spins Bonus! Grab 15 Free Spins with tripled wins when you land 3 or more on the reels!